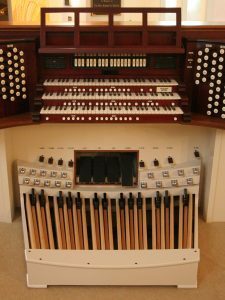 This new three manual and pedal organ has 47 independent speaking stops and 61 ranks of pipes and incorporates several sets of pipes from the Church’s former organ, a 19th Century Johnson which was heavily modified in the 1970’s. 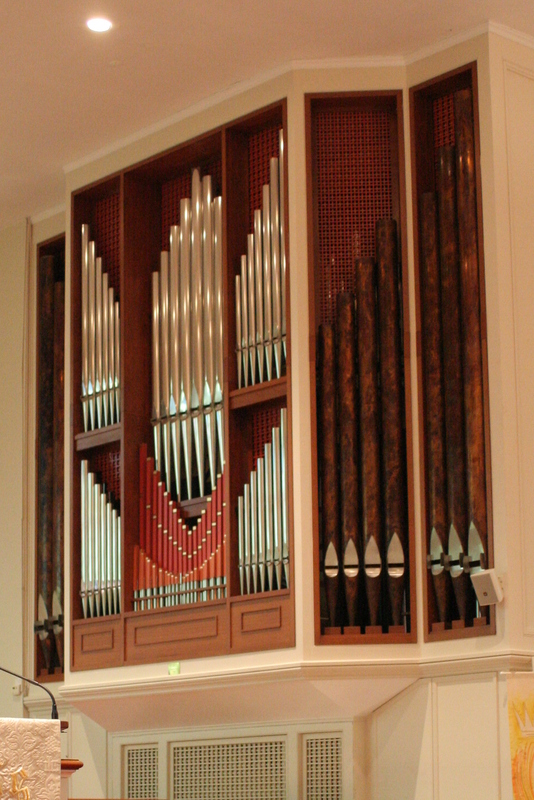 It incorporates the best components of the former organ’s façade blended with new pipes to present a more unified visual effect. An interesting feature of the new façade is the painted 8’ Dulzian in the central flat, whose enameled wood resonators relate to the 16’ Pedal Principal of flamed copper on flanking sides. The organ utilizes electrically operated Slider & Pallet windchests. 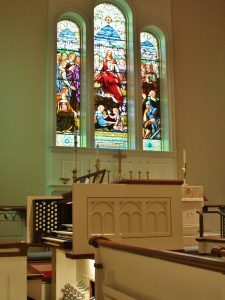 The Organist and Choirmaster is Randall Ruthsatz; Jeff Fowler & Jim Hart are the Construction Committee Co-Chairs, and the Rector is the Reverend Jan Smith Wood. This is John-Paul Buzard’s 44th new organ, installed in Grace Episcopal Church in Sandusky, Ohio. 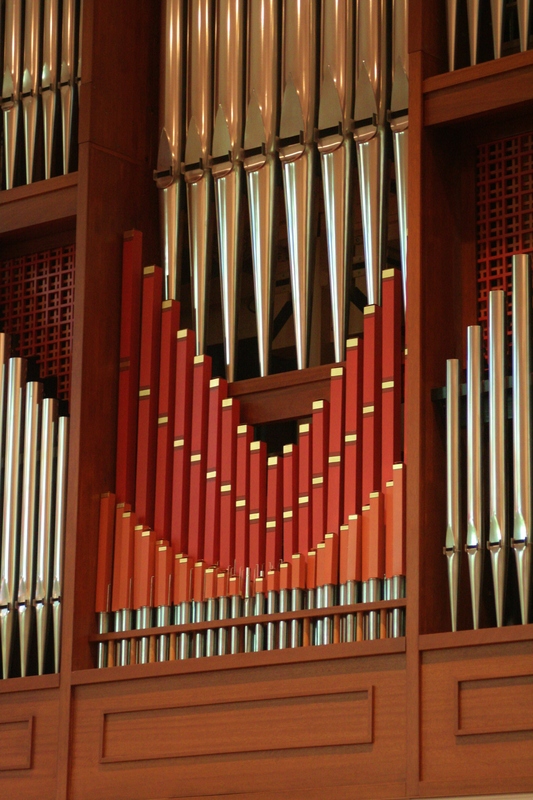 The new three manual and pedal instrument contains 47 independent registers and 61 ranks of pipes, retaining many ranks of pipes from the Parish’s former instruments. Grace Church’s culture is one of intense concern for stewardship and sustainability. They waste nothing; they cherish items of value from the past whenever possible. Their need for a new organ therefore posed both a challenge and an opportunity. They asked us to save everything that was good about the previous instrument, but not at the expense of mechanical reliability and tonal cohesion. Their previous organ had been rebuilt and substantially altered three times, and everyone acknowledged that it was time for the instrument to speak consistently with a single artistic voice. The previous organ started its life in 1893, as the Opus 793 of Johnson & Son of Westfield, MA. It was well-made and typical of late 19th-Century instruments. The original façade of stenciled pipes wrapped around the case front to the side facing the congregation. The action was mechanical. 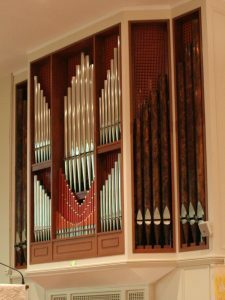 In the 1960’s, the Schlicker Organ Company rebuilt the organ under the guidance of Robert Noehren, retaining some of the Johnson’s pipes and the mechanical key action. However, string pipes were cut down to play at higher pitches, mixtures were added, some new reeds appeared, others were retained and made to play on significantly lower wind pressures, and the character of the organ was changed forever. In the early 1970’s the organ was rebuilt yet again, this time by Daniel Pilzecker. The wrap-around stenciled façade pipes were replaced with polished zinc and dark brown flamed copper Pedal Principal pipes and the façade was given its current contemporary look utilizing simple rectangular frames. The central portion of the Pilzecker façade sported a Trumpet stop. 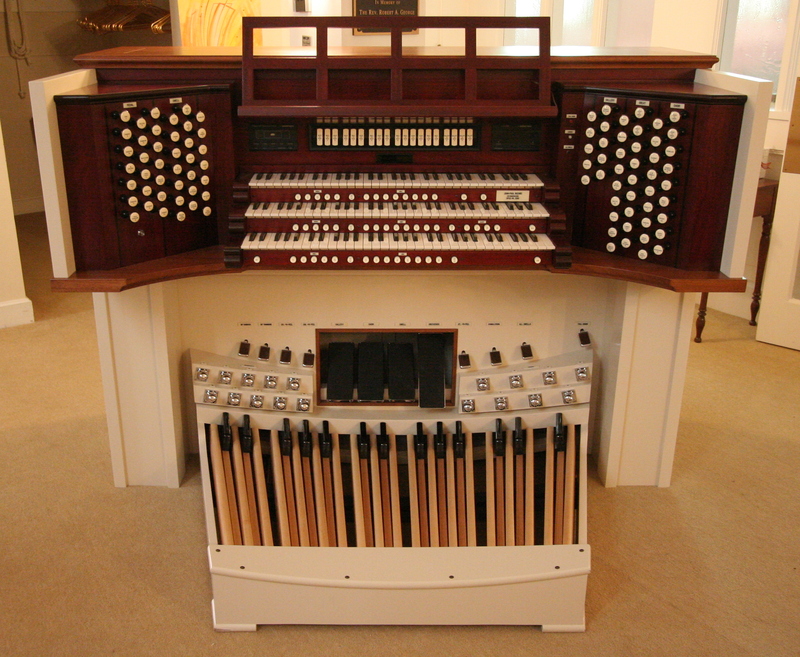 The Pilzecker rebuild also retained the organ’s mechanical key actions. But this was not a happy pipe organ. Its thin and bright sounds did not carry into the Church. Pipes originally voiced on 5” of wind pressure were being asked to play on pressures less than half of that. The mechanical action of the 19th century was clumsy, heavy, and the cause of increasing frustration. In the 1980s the Congregation addressed the musical deficiencies by building a ten stop Antiphonal Organ in twin C-and-C# cases on either side of a window in the rear gallery. Although this assisted in musically supporting congregational singing, its electrical connection to a failing mechanical system spelled further doom for the Johnson/Schlicker/ Noehren/Pilzecker organ in the Chancel. During the 2012 Chicago OHS Convention we met Grace Church’s organist, Randall Ruthsatz. A long-standing veteran of the old instrument, he knew that the only real way for an organ to succeed at Grace Church was to start over. But, the parish’s culture of placing high value on its past efforts posed a potential problem. Several current parishioners were part of the 1970’s rebuilding project; the parish had just said good-bye to a much loved priest; the interim Rector was both holding the Church together and finding ways to widen the Parish’s ministry to the people of Sandusky. This would be a difficult time to undertake a large project. In order to determine what could be possible, we thoroughly researched the existing instrument. Chief Engineer Charles Eames and Tonal Director Brian Davis found ways to re-use as much as possible from the three iterations of previous organs – and yet be able to create a Buzard Organ. 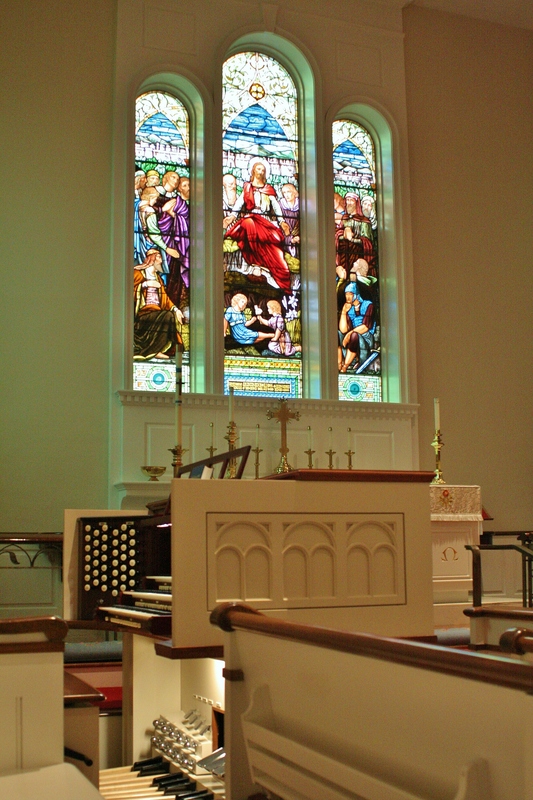 The instrument had to be considered new; but the parishioners needed to be able to take comfort in that a great amount of their old instrument would be represented in it and that by doing so they would be extraordinarily better stewards of the Church’s history and finances than if they had rebuilt the organ yet again. Keith Williams and I met with then Interim Rector Jan Smith Wood (who later became Grace Church’s permanent Rector) and communicated the most important aspect which a properly designed, scaled, voiced and built organ could provide: inspired worship and deepened connection with God. Knowing that this was likely the last opportunity that Grace Church would have to undertake an organ project, we recommended that they retain consultant Scott Riedel to guide them through the process and provide them with a comfort factor in view of the project’s cost. He confirmed the wisdom of our approach and communicated to the Vestry our high reputation for respect of original builders’ work in other projects in which we had previously collaborated – and our reasonable pricing. We kept the beautiful Johnson wooden flutes, although Brian re-scaled them a few notes larger; the Great and Positiv Mixtures from the 1960’s were re-composed and revoiced for the new context and to be compatible with our style; the dark flamed copper 16’ Pedal Open Diapason pipes were cut up higher and winded properly; the Pedal Principal and Mixture using original Johnson pipes were retained, as was the original Vox Humana. The Vox was most unhappy, having been originally voiced on 5” Wind, but being made to play on 2 ¼”. Brian re-tongued the pipes, shortened their resonators and modified the caps to produce a colorful more Continental sound. It can be as romantic as you like, but without the Tremulant it colors the Swell flues quite convincingly for baroque literature. Because so much of the original pipework was previously altered to appeal to an “Organ Reform” sensibility, we felt the need to keep the tonal leaning of the organ to the classic side. However, we created our signature warmth and tonal vitality with both the revoicing techniques Brian employed on the old pipes and the new flues and colorful reeds we added. 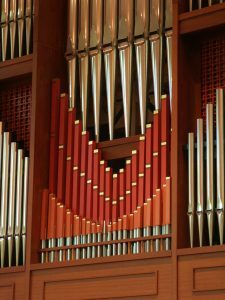 Since we retained the 16’ Pedal Diapason pipes in the façade, we also re-used the façade’s toeboards and their pipe spacing to provide an overall appearance similar to the previous organ. But where the 8’ Trumpet formerly stood (or drooped! ), we installed a new wooden 8’ Dulzian which plays on the Choir. Its warm, round and mildly throaty tone is magic with renaissance music, but it blends and balances with any flue stop in the enclosed portion of the Choir located in the expression box behind and above it. I had fun enameling and decorating its maple resonators. The result is a dynamic liturgical instrument which, because of careful and informed scaling & re-scaling, voicing & re-voicing, will play anything thrown at it musically and energetically. Just like on the HGTV show “Fixer-Uppers,” we encountered some unexpected flaws in quality of one of the previous rebuilds, completely inconsistent with the high level of the original Johnson workmanship. This is where our commitment to excellence in the finished product was not only put to the test but confirmed by the end result.